At Haven Financial Group, we are a tight team of Financial Portfolio Managers that offer other professional financial services to our clients. We are highly educated, experienced, and we’ll always be professional. Not only that, we’re people too, so we understand how important personal and small business finances can be. We provide our customers with everything that they need to reach their financial goals, from consumer credit counseling services to small business marketing. We provide free consultations because we want your first step to be worry-free and risk-free. We know that you’ll feel comfortable with your financial future, because you’ll be comfortable with us. We thrive on our clients’ success, and we’ll aim to aid that success with all of the resources that we have at our disposal. We are your local professional financial consultants – and we look forward to your bright financial future. We aim to gain your trust. Our company thrives on word-of-mouth advertising, and with 15 years of experience under our belt, we know how to meet your needs. Call on us for a free consultation today! 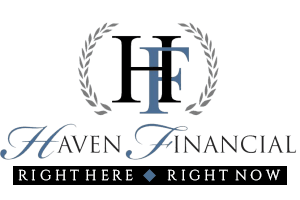 When you call on Haven Financial Group, we’ll begin with a free consultation. From there, we’ll build a financial plan that suits your needs, and we’ll enact that plan promptly. Click to learn more! We’re an assemblage of Financial Portfolio Managers. We pride ourselves on excellent services and highly successful accounts. Learn more about your financial service professionals here. Haven Financial Group is Your Best Business Development Team.